The presentation of the effigy here is atypical, as it has no distinct separation from the stem of the handle. The effigy appears to be the head of a pig with ears, snout, and an open mouth. Though excavated examples have been recorded, this is the only documented pig effigy ladle known. 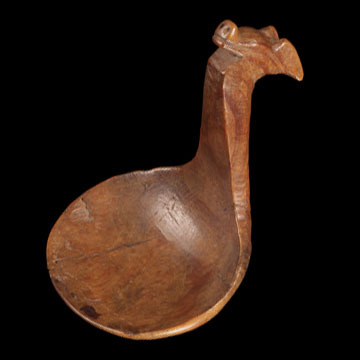 This is the smallest ladle in this collection and one of the smallest documented.